☺ HEALTHY & DIY PUMP -- Olive Oil Spraye No any propellant ingredients (BPA) and you could pump and spray it yourself to control the amount of oil ,then to keep fitness. ☺ VERSATILE & ECONOMIC -- Widely suitable for most types of oil (Olive oil, coconut oil, grape seed oil) as well as vinegar, juice and water. ☺ Anti-clog -- Upgraded version adds a special filter oil mister , so even you fill in fresh herbs or fresh squeezed olive oil, there is nothing to worry about. NOTICE: Please clean and dry it thoroughly before you change to another liquid, Or not , it may work not normally. ☺ EASY & PORTABLE -- Simply pump it for a few times , then and press the valve on the pressurized sprayer for super-fine mist. 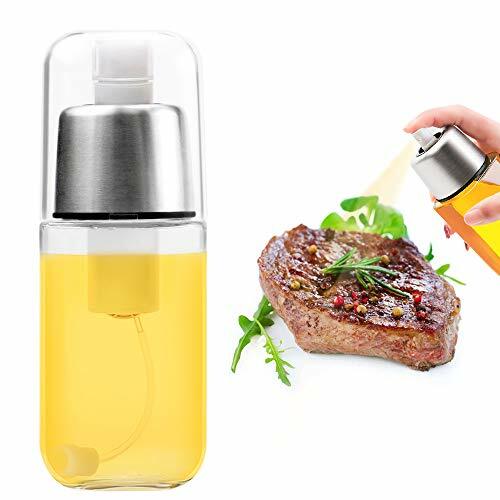 And the compact bottle allows you to take it out of the kitchen, come to the dining table, outdoor barbecue.is nothing to worry about.s not been cleaned and dry, or not, it may work not very well. ☺ ELEGANT DESIGN & LARGER CAPACITY -- The mister bottle is made of high quality Sodium-calcium glass (which is Stronger and more smooth,of course more safer ), Sleek borders and stainless steel make more comfort while using . 200ml larger capacity help save time to let you making more fun while cooking .